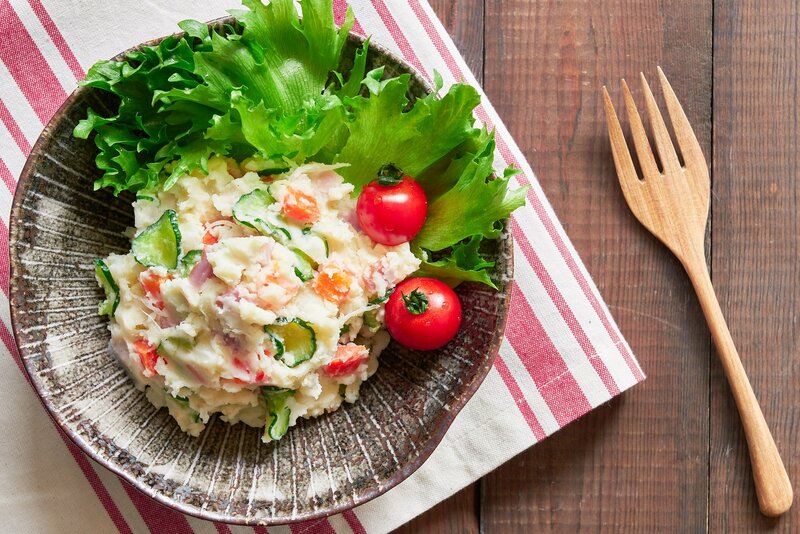 Creamy and colorful, Japanese Potato Salad is a classic side in casual Japanese cooking used in bento boxes and garnishing dinner plates around the country. While Japan may be famous for sushi, home cooking draws from a broad palette of global flavors. 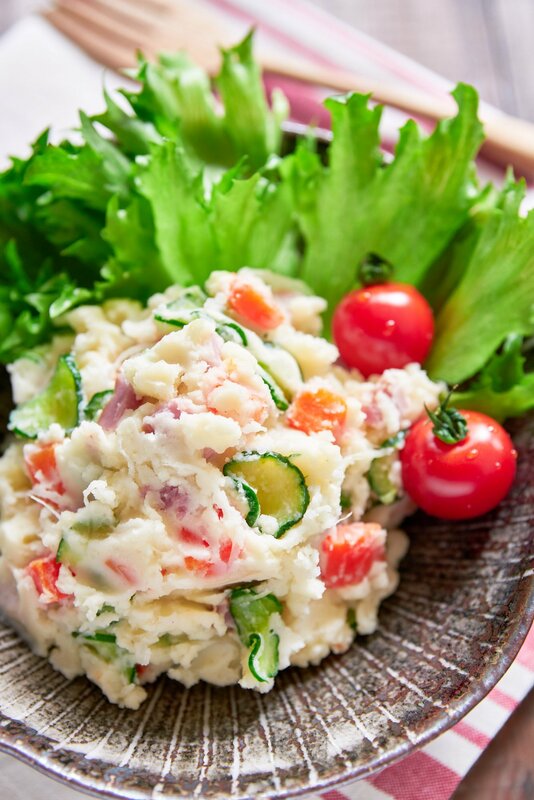 This includes distinctly Japanese takes on foreign dishes like this potato salad. With a rich creamy texture that’s balanced by a mild tartness and sweetness, this easy side makes for the perfect accompaniment for other home-cooking classics such as Karaage, Tonkatsu and Chicken Nanban. If you’re sending a pattern here that’s because potato salad is often served with fried foods in Japan. So what makes this Japanese? First, the potatoes get cut up relatively small. This not only speeds up their cooking time, but it also makes the spuds fall apart as you mix them with the dressing (think mashed potatoes). 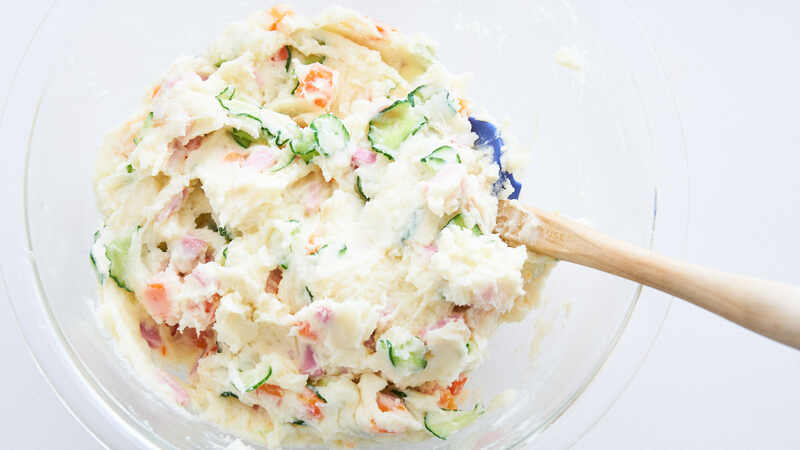 The reason for this is that by mashing them together with the dressing, the flavor gets evenly interspersed, ensuring you don’t end up with any bland bites of starchy potato. The one downside is that it makes the texture a bit boring, which is where the other ingredients come to the rescue. 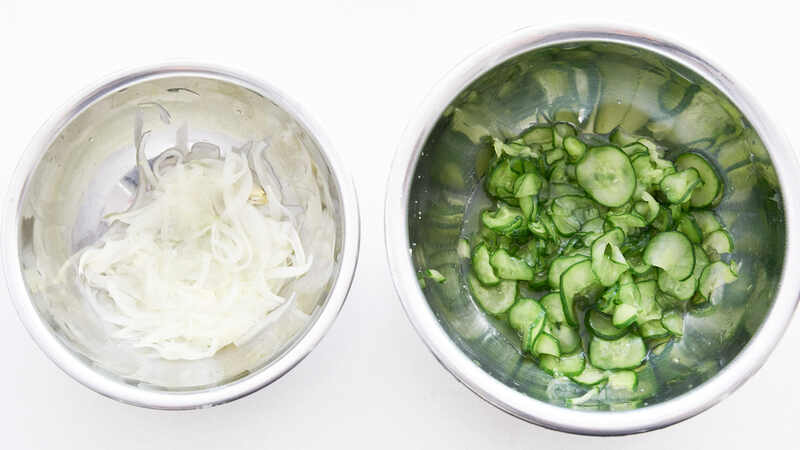 Quick pickled cucumbers add an emerald green hue and satisfying crunch to each bite. I like to use either Japanese or Lebanese cucumber because they have soft skin and almost no seeds. If you use another variety, you may want to peel and or seed them. Either way, it’s important to salt them first and then squeeze them very well to keep your potato salad from getting soggy. Although they don’t add any color, onions go in for flavor and a nice crisp crunch. I like to massage them first with a bit of salt before washing them to tame their pungency a bit. 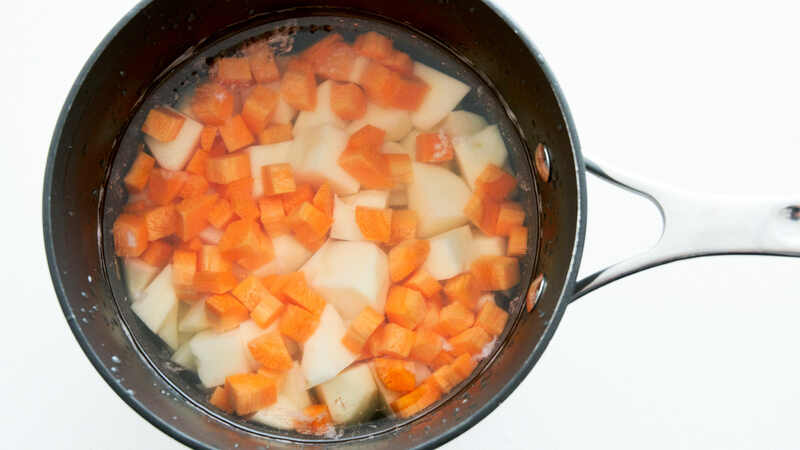 Adding carrots in with the potatoes as they boil not only adds a splash of color, they contribute a balancing sweetness to the savory and tart potato salad. 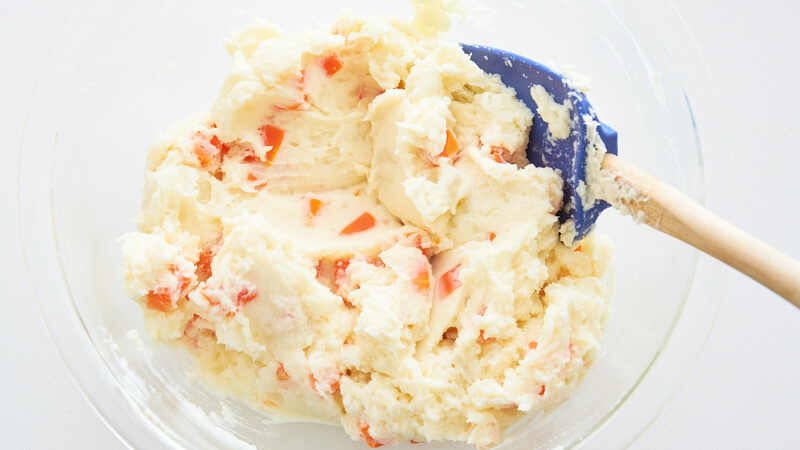 If you like your potato salad even sweeter, try adding some chopped apples at the end. Finally, some pink ham not only rounds out the rainbow of colors but also adds a salty burst of flavor to the potato salad. You can garnish the salad with some sesame seeds or scallions (as I’ve done), but it’s not necessary. Slice the onion thinly and sprinkle with a generous pinch of salt. 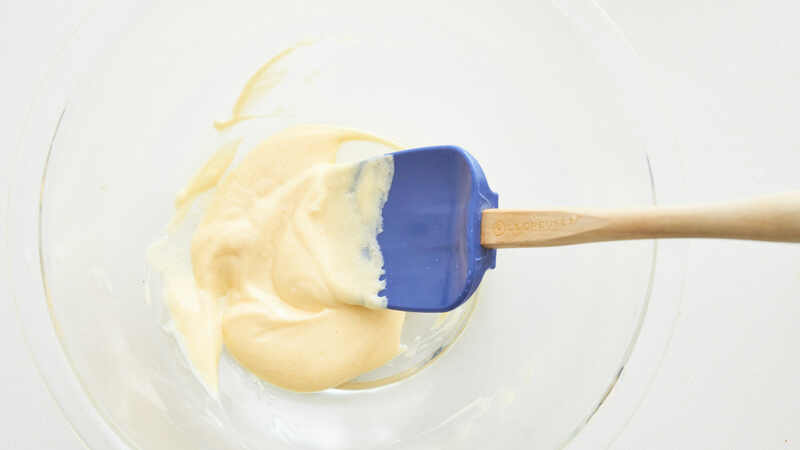 To make the dressing for the Japanese-style Potato Salad, add the mayonnaise, rice vinegar, sugar, and salt in a bowl and whisk to combine. When the potatoes are done, drain them well and add them to the dressing. Stir well to combine; it's okay if some of the potatoes get mashed in the process. Massage the salted onions to get them to release their liquid and then rinse with water. This reduces their pungency. Squeeze the washed onions and add them to the potato salad. Massage the cucumbers to get them to release their excess water and then squeeze very well. Add to the potato salad. Add the ham and then stir everything together. Adjust salt and pepper to taste.